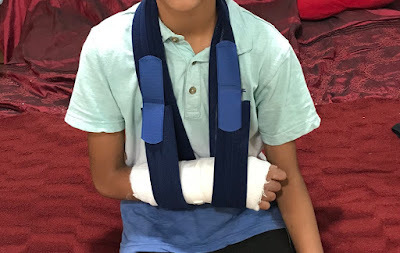 Gorgeous came home from school this week cradling his wrist and telling us it was causing him a lot of pain. Two weeks into his first year of high school, one of the Year 11 boys kicked a ball into his hand with full force. He tells me it’s not the first incident, one of his friends was hit with a ball by the Year 11’s and knocked clean out. I didn’t fancy taking him to the Accident and Emergency on a busy Friday night, so gave him pain relief and sent him to bed. Instead, we went after Fajr (dawn) prayers when we found it empty and were seen without any delay and back home by eight in the morning. It turned out he had fractured his wrist in two places. After his older brothers fractured ankle earlier this year, where he got stomped on during a game of football, I don’t fancy having to go back to A&E again, nor to the ongoing fracture clinic appointments. I might have a word with the school about overly boisterous football players.